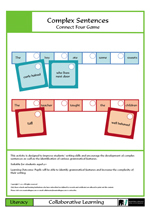 This activity is designed to improve students’ writing skills and encourage the development of complex sentences as well as the identification of various grammatical features.Learning Outcomes: Pupils will be able to identify grammatical features and increase the complexity of their writing. 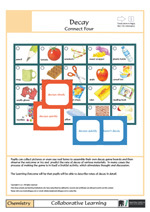 This activity was developed in order to familiarise students with compound nouns but it also illustrates the historical development of language. Some of the words are no longer in use and some like treadmill have developed a new meaning. 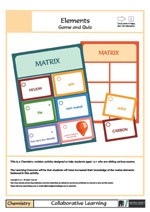 The activity can be used both for literacy and history.Learning Outcomes: Students will have learned the meaning of compound nouns as well as having broadened their vocabulary. 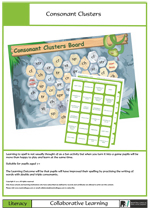 Learning to spell is not usually thought of as a fun activity but when you turn it into a game pupils will be more than happy to play and learn at the same time.Learning Outcomes: Pupil will have improved their spelling by practising the writing of words with double and triple consonants. Inspired by time-lapse photos of decaying fruit, this activity has been adapted to a ‘do it yourself’ version. Pupils can collect pictures or even use real items to assemble their own ‘game boards’ and try the activity out on each other. In many cases the process of making the game is in itself a fruitful activity, which stimulates thought and discussion. We have provided a sample board with pictures as a starting point for this game. Learning Outcomes: Pupils will be able to describe rates of decay in detail, research and narrate their findings. 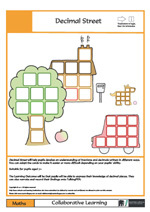 This activity has been devised to help pupils with the understanding of fractions and decimals written in different ways. You can adapt the cards to make it easier or more difficult depending on your pupils’ ability. You could also record the numbers in different languages for those whose second language is English.Learning Outcomes: Pupils will be able to express their knowledge of decimal places. 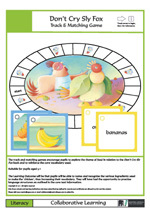 The track game has been devised to encourage pupils to explore the theme of food in relation to the Don’t Cry Sly Fox book and to reinforce the core vocabulary used. Learning Outcomes: Pupils will be able to name and recognise the various ingredients used to make the ‘chicken’, thus increasing their vocabulary. They will have had the opportunity to practice language structures as outlined in the core text information. Students learning English often find they are not sure when a word needs a double or a single consonant. 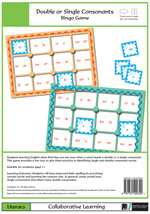 This game provides a fun way to give them practice in identifying single and double consonant words.Learning Outcomes: Students will have improved their spelling by practising certain words and learning the reasons why, in general, some words have single consonants and others have double consonants. 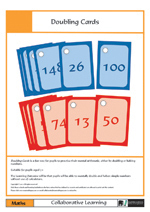 Doubling Cards is a fun way for pupils to practise their mental arithmetic, either by doubling or halving numbers.Learning Outcomes: Pupils will be able to mentally double and halves simple numbers without use of calculators. 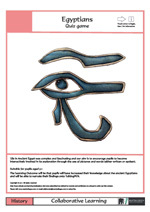 Life in Ancient Egypt was complex and fascinating and our aim is to encourage pupils to become interactively involved in its exploration through the use of pictures and words (either written or spoken). We have left some of the activity cards blank so that pupils can make their own versions.Learning Outcomes: Pupils will have increased their knowledge about the ancient Egyptians. We are always trying to think of activities to make revision fun and this is essentially such an activity turned into an interactive game. 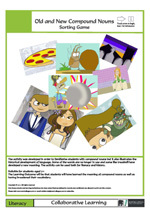 For students to further test their knowledge we have also included an Elements Quiz. Learning Outcomes: Students will have increased their knowledge of the twelve elements featured in this activity.